Full Disclosure: Me and my pear shaped body were never fans of the slip dress. I think it dates back to the late 90s, I was in middle school and slip dresses were ALL the rage (along with chokers and baby tees…especially all 3 worn together) but I was a curvy 11 year old and could barely find jeans that fit properly. It’s safe to say me and ALL the trendy things weren’t friends. Fast forward 15+ years and here I am trying to convince you that a slip dress is THE dress you won’t regret buying at the end of the summer. Let’s just say slip dresses have changed a lot in the past decade or so. I’m all about the lower hemline (I’m so into midi length dresses right now), the deeper neckline (and back on this one), the high slit AND the ability to belt it, which makes this dress fit my body perfectly!! This slip dress is particular is one of my favorite purchases this summer! 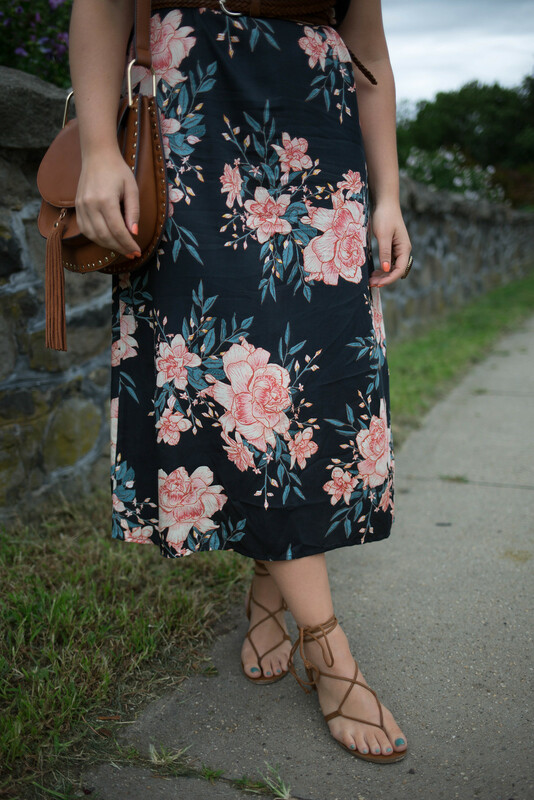 You all know that I’m a huge fan of florals all year round, but dark moody florals in fall are on the top of my list of favorite seasonal prints. I’m actually not sure there could be a more perfect dress to buy in August! You can wear slip dresses now in the heat and humidity with sandals and a straw boater hat like I am here, but you can also perfectly transition your newly acquired slip dress for cooler weather in September and October with booties and a chunky sweater. You can even transition a slip dress for winter with some wool tights and over the knee suede boots. To say the styling options are endless is an understatement. I can guarantee this won’t be the last time you’ll see this dress this year and if you pick up one for your closet I guarantee it will instantly become the dress you won’t regret buying at the end of the summer because there are SO many ways to wear it into Fall and Winter and even into Spring! I’ll even go as far as saying slip dresses are NOT a trend they are a staple, one you should definitely put on your wishlist! That is such a great dress, I love it! I’m in love with this gorgeous dress! The print and colors are so beautiful!! This dress looks amazing on you! I love how you belted it. Super cute! What a pretty floral print girl! Perfect dress for the transition too! I have those sandals and hat, worn them all summer! This dress is so pretty! I love the floral pattern and I can definitely see it transitioning well into Fall with a cozy cardigan and ankle boots. This is the most gorgeous summer outfit! Beautiful!!! Love that floral dress and hat!! I love wearing my florals into Fall by adding cognac accessories and easy layers like a denim jacket or duster cardigan! such a cute dress, i love the darker print! I love a good slip dress & I can totally see this transitioning into fall with a cardigan sweater & booties – so cute! The print on this dress is so gorgeous! I love how you styled it! This dress will look so cute with a slouchy cardi for fall! This will transition so well into fall! I love the colors! Ah this dress is beyond! loved all the accessories too!! That floral print is so pretty! love this floral dress on you! can’t believe summer is about over! I love your dress..but totally digging that purse girl!! You looks so pretty.The floral dress is so elegant,love it!